Marissa Paternoster of Screaming Females perform at The Eagle Rock Center of the Arts. They shred with precise efficiency under the blinding, siezure-astic strobes. Ordered chaos with laser sighting concentration. 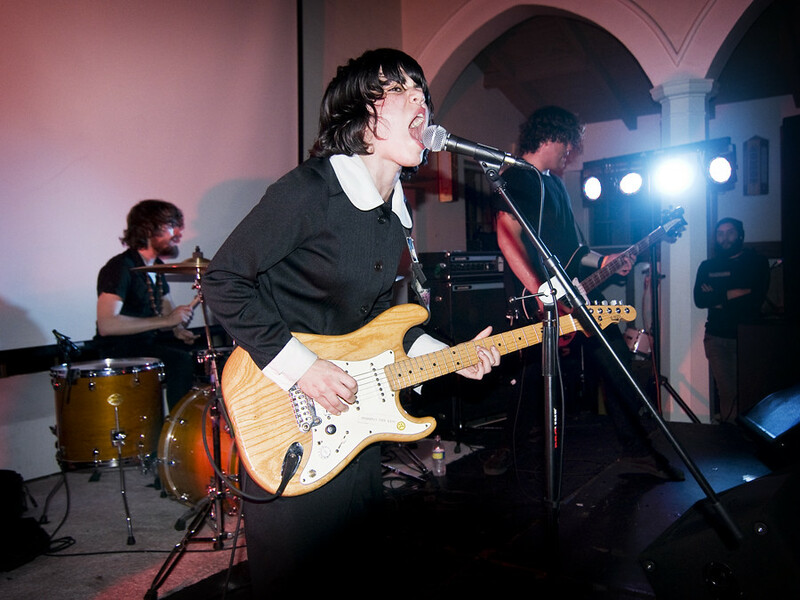 Screaming Females, the New Jersey trio who has been featured on Spin Magazine and Rolling Stone brought their garage-punk wailings to the Eagle Rock Center of the Arts last Thursday and put on a show for the ages. Tormenting Smashing Pumpkins-esque melodies sewn with sharp, Van Halen-like riffs, pint-sized front-woman Marissa Paternoster screams and thrashes without abandon. But although it seems like they're raising anarchy onstage it's Screaming Females' sense of control that impresses most, like a well trained knife juggler, you cant' take your eyes off them - sooner or later they may draw blood. They're currently on their West Coast leg supporting the release of their fifth studio album, Ugly, which was released earlier this month. Tonight, they perform at Pomona's VLHS Warehouse and then play the Continental Room in Fullerton on Monday. "It All Means Nothing" by Screaming Females.